Violet Keeler-Fox tries on a new outfit ahead of the coming school year. Violet Keeler-Fox and Madeleine (Mado) MacInnis have been thinking about their outfits for the first day of school ever since summer vacation began in June. "I don’t want school to start again – except for that!” Mado says of planning what she’ll wear. We go back-to-school shopping while the getting is good, in late July, just as fall clothing arrives in stores. With their mothers – Misty Fox, a special effects makeup artist, and visual artist Joy Broadbent – in tow, I’m shadowing 11-year-old Violet and soon-to-be-10 Mado as they find new togs for Grades 6 and 5, respectively. The girls like secondhand shopping because their limited budgets can go further, so our first stop is the independent shop Tambourine in Toronto’s Roncesvalles neighbourhood, which carries Filly & Foal, a line of handpicked vintage clothing for kids. The girls sift their way through the racks of one-offs, putting together outfits that don’t conform to any particular trend but inspire individuality. Madeleine MacInnis checks out a top as she prepares for Grade 5. We’ve been talking about clothes for an hour with no mention of brands, celebrities or Snapchat. Neither girl can name a single designer, for example, but each readily rhymes off a list of her favourite Value Village and charity shop outlets in the city, in descending order. Now that they’re old enough to go shopping with friends rather than parents, the cheap and unique finds at thrift stores figure as often as the mall. The girls have a few things in mind for the all-important first day of school, and Mado finds one wish-list item, an acid-wash Levi’s jean jacket, almost immediately. She and Violet take turns trying on a retro Girl Guide shirt and scrunching up the long sleeves (though it’s less interesting for Violet, who is actually in Guides), and with every outfit they try on, there’s a pragmatic and/or imaginative reason for why it works or doesn’t. The girls both have a few things in mind for the all-important first day of school. 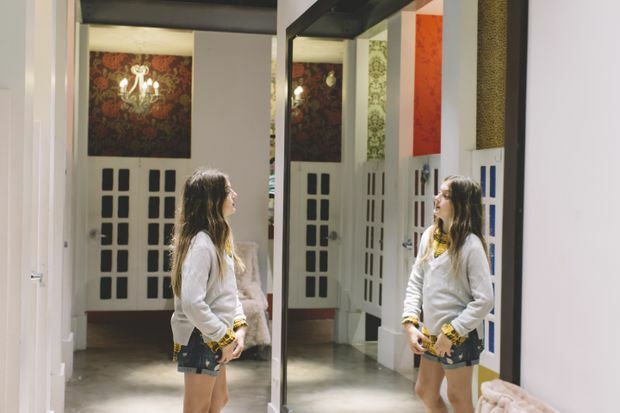 We move on to Garage: The Montreal-based teen casuals chain is currently Violet’s favourite store, and is catnip to tweens the way Le Chateau was to Gen X. 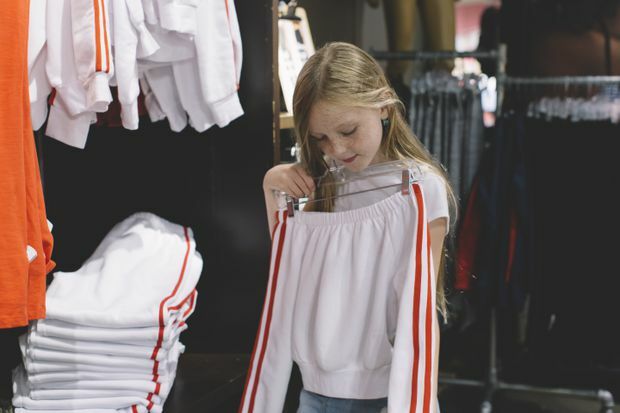 “I like Garage because all the clothing there is really cool, flowy and trendy – and I am a trendsetter at my school,” she says. Mado, who has only just grown out of kids’ sizes over the summer, is intrigued because she’s never been to Garage before, whereas Violet has the app on her phone. “I like to just scroll through their clothing and pick ideas of what I like,” Violet says. It’s a very quiet Monday at the Dufferin Mall – or as Violet calls it, “the Sufferin’ Mall” (“because everybody suffers when they’re there, especially my mom”) – but as soon as we cross the threshold of Garage, there’s a marked shift in the girls’ energy. The measured pace and relaxed conversations about outfits is gone and everyone’s keyed up – almost giddy. It could be the garish lighting and mismatched chandeliers, or the clash of magenta and zebra-print, but there’s a sense of urgency radiating from the rainbow of shirred tops that fan out on displays. Madeleine has only just grown out of kids' sizes. "They’ve died and gone to heaven here I think,” Broadbent says as the girls flit around the racks. There’s nothing remarkable about the cropped hooded sweatshirts, cutoff shorts, tunics and tops (meant to be worn off-the-shoulder and all the rage; they will buy three by the end of the day). It’s all as generic as the tinny pop music in the background. Mado is beguiled by the off-the-rack crop tops. "I make them,” she says. Almost every look inspires an idea for a shirt hack, growing up around artists (her mother is an artist, her father a musician), she’s “obsessed” with the creative process of making clothing and customizing it. When Violet and Mado compare the day’s purchases, there’s no single trophy item. 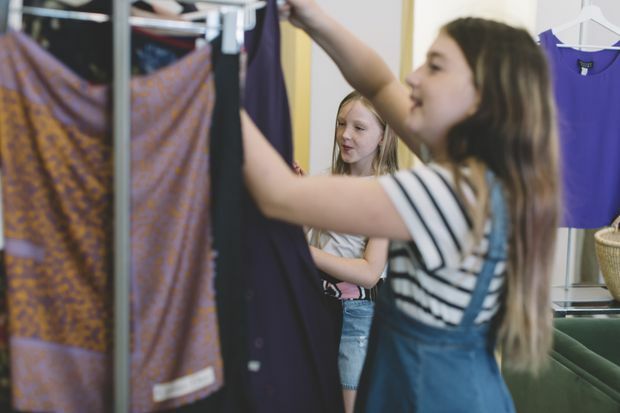 Although the back-to-school outfits start off-the-rack, the fun will be in the coming days when they girls customize the pieces into looks, incorporating their personal taste in creative ways that express identity. Maybe it’s a reflection of the priorities shaped by their Gen Y parents, but the girls are already preoccupied with individuality. They instinctively get that the finishing touch isn’t something you can buy, not even at the mall.